Greg / September 30, 2014 / Comments are off for this post. Do you happen to have more dish towels than you need, a drawer full of rubber bands, or perhaps an old cork from a wine bottle? Instead of tossing these items in the trash, try upcycling them. Upcycling, is a great way to get use out of old items you don’t use anymore by repurposing them. This article from Enviro Maids, has several tips for ways to upcycle common items found in most kitchens. Time to turn that would-be trash into something creative and useful. Don’t toss your old dish towels, paper clips, or rubber bands —upcycle them! Upcycling is recycling’s close relative. The term upcycling — repurposing an old item into a new product — gained popularity in the early 90s. While recycling is an important way to limit your carbon footprint and to protect the environment, you can do more by learning about upcycling. There are many ways you can upcycle kitchen items and turn them into useful items around your home. Upcycling is a great way to make your home more organized so it will run more efficiently. Here are some of our favorite upcycling ideas, with the help of Realsimple.com. Dish Towels: Turn all those colorful and decorative dish towels you’ve collected over the years into unique wine “bags.” Simply take a towel (free of any stains), spread it flat on a table and place a bottle in the center; wrap the towel up and around the bottle of wine. Secure the towel to the bottle by tying a piece of ribbon, sturdy string, or raffia around the neck of the bottle. Egg Cocktail Shaker: Have one too many cocktail shakers taking up space in your cupboard? Turn one into a handy breakfast tool. Use your cocktail shaker in the mornings to make fluffy omelets and scrambled eggs. Add eggs, milk, and your favorite vegetables in the shaker, cover it with the lid, and give it a good shake. Pour the contents out into your skillet and you’re ready to start your mornings off to a tasty start. Silence a Loud Cabinet Door with Cork: Stop your cabinet doors from making that loud banging noise every time you close them with the help of wine bottle corks. Cut two ¼ inch slices off the edge of a cork and attach the pieces to the inside corners of the cabinet or to the inside corners of the cabinet doors. Have a Stuck Lid? Rubber Bands to the Rescue: Trying to open a jar of food can sometimes be a slippery situation. Stretching a rubber band around the lid gives you better grip, so you can unseal it easier. Rubber bands are also helpful for getting nail polish bottles that seem to be painted shut opened in a flash. Wrap a rubber band several times around the top, and twist it open. You’ll be polishing your nails in no time. No Candle Sticks? No Problem — Use Old Wine Glasses: When you want to add the warm glow of candles to your next dinner party, but don’t have any candle sticks handy, put your old wine glasses to use. Flip a few glasses upside-down and prop a pillar candle on top. For an added touch, add a flower or place card inside the bowl part of the glass. Leftover Wrapping Paper: If you’re like most people, you probably have a bunch of different wrapping paper rolls hanging around with very little paper left. Use those remaining pieces to line a serving tray for a decorative touch. Hosting a holiday party? Use your Christmas or Hanukkah-themed paper. Hosting a ladies brunch? Line a tray with a floral print. Chopstick Tea Brewer: Like to brew your own iced tea, but struggle to keep the teabag strings from falling in during the steeping process? Tie a few tea bags around a chopstick and rest the chopstick horizontally across the top of the pitcher. No more having to pick labels and string out of your fresh iced tea. Paper Clips Prevent Stale Chips: To help keep your favorite chips or pretzels fresh, clip the top of the bag with a large paper clip or binder clip. From Cake Stand to Chip and Dip Server: A cake stand is an elegant way to display a cake, but if you find you rarely use yours, turn it into an appetizer tray. Turn your cake stand upside-down and fill the flat part around the pedestal with crackers, chips, pretzels, etc. If the pedestal is hollow, use this area to fill it with dip, hummus, or olives. Makeshift Pencil Case: Plastic zipper bags aren’t just for storing food; turn them into a pen/pencil/marker holder. Punch three holes along the non-zippered edge and clip the bag into a three-ring binder. Aluminum Foil Paint Catcher: Trying to paint around door knobs and kitchen cabinet handles can be a real nuisance. To keep paint from dripping onto door knobs, handles, and fixtures, wrap the area you don’t want to paint with aluminum foil. Greg / September 25, 2014 / Comments are off for this post. It is no secret that switching from chemical laden traditional cleaners, to more natural green cleaners at home, can help keep you and your family safer and healthier. However, how can you be sure you aren’t inadvertently inhaling toxic chemicals at your office? Recent studies have shown that cleaning substances, are among the top reasons for exposure to poison in adults. So, what are some things you can do to make sure your office isn’t a hazard to your health? This article from Green Cleaning Magazine, discusses several steps you can take to ensure a safer work environment for you and your coworkers. Recent government reports and non-profit studies have revealed that exposure to chemicals and toxins found in common cleaning products can cause reproductive problems, lung issues, and multiple forms of cancer. In fact, a recent EPA study concluded that toxic chemicals in common cleaners are three times more likely to cause cancer than outdoor air. Additionally, in 2013, the American Association of Poison Control Centers listed cleaning substances as one of the top three most common reasons for exposure to poison in adults. One of the most prolific places for exposure to concerning cleaning chemicals is the workplace. Are you longing for a clean and green office? Check out 10 green office cleaning tips below—offered up byOpenWorks, a leading commercial cleaning and integrated facility services company—and share them with your office’s manager. These tips can help all employers and cleaning professionals avoid dangerous cleaning products and create healthier work environments. 1. Quick-Fix Means Danger: Avoid air fresheners and fabric protection sprays as they contain chemicals linked to endocrine system issues, like reproductive problems. 2. Treating Carpet is a No-No: Stay away from carpet floors if you are opening a new facility. However, if you do have carpet, avoid carpet cleaners and stain-resistant treatments that expose your office to chemicals. Rely on a steam cleaner instead. 3. Beware of Old Furniture: In recent years, laws have been created to rid the furniture market of PBDE’s, which are fire retardants that break down into dangerous metabolites linked to cancer. Old furniture may be putting your office (and its workers) at risk. 4. Replace Cleaners with Clever DIY Tricks: For DIY projects, there are many standard household items that can be used to clean surfaces and handle tough odors. These include, but are not limited to, lemon, cooking oil, vinegar and baking soda. 6. Make Air Quality a High Priority: A recent EPA study concluded that toxic chemicals in household cleaners are three times more likely to cause cancer than outdoor air. Additionally, consistent exposure to other dangerous elements (like asbestos) has been linked to cancer and mesothelioma. Make sure your internal and/or external cleaning team has the resources to check HVAC/ventilation systems and control air quality. 7. Go Green with LEED-Certified Cleaners: It’s important to make sure that the cleaning crew who maintains your building is LEED certified. The US Green Building Council ensures LEED certified facility management teams are up to speed on best practices regarding green cleaning. Help the environment while keeping your staff healthy. 8. Don’t Skimp on Cleaning Technology: Commercial cleaning experts are investing considerable time, money, and resources to improve health and quality. Technological advancements, like sprayer nozzles that reduce chemical releases, are making a big difference. Invest in modernized cleaning equipment to take advantage. 9. Establish a Cleaning Policy with Employees: All of the changes you make as an employer will be compromised if your staff neglects to follow suit. Educate your employees on the damaging effects of cleaning products and create a policy that restricts and/or bans their use. 10. Hire a Proven Cleaning Company that Values Health and Open Relationships: Trust a commercial cleaning and facility maintenance company who uses only safe, environmentally sound products and understands green cleaning techniques. Make sure they work with you to understand the your specific needs. How Clean Are Commercial Flights? Greg / September 19, 2014 / Comments are off for this post. 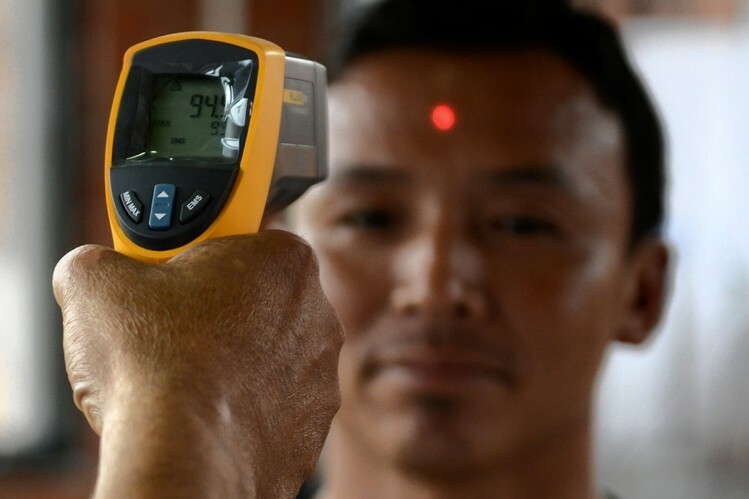 With the recent Ebola virus crisis, concerns about health and safety on commercial flights have increased. Let’s face it, when you’re 30,000 feet in the air, and major cities appear as random clusters of light; the cleanliness of your plane is the last thing you want to worry about. Unfortunately, many of these worries may be warranted. This article from The Wall Street Journal, discusses the cleaning regulations (or lack thereof) of many commercial airlines. My advice, load up on Vitamin C and hand sanitizer before your next flight! 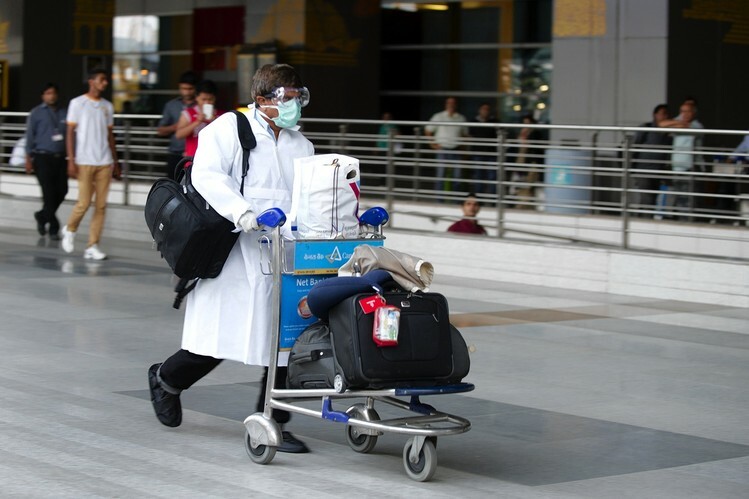 The Ebola crisis and heightened concerns about the risk of spreading disease during air travel have focused concern on what airlines do to keep planes clean. It’s a murky area without clear regulatory standards. The Federal Aviation Administration says it doesn’t regulate or inspect cleaning and referred a reporter to the Occupational Safety and Health Administration, which says it has nothing to do with aircraft cleanliness. OSHA suggested contacting the FAA. The FAA then suggested the Food and Drug Administration. The FDA says it inspects food and water safety on commercial aircraft only. Airlines say they set their own standards without regulators and give voluminous instructions to contractors. They use chemicals approved by aircraft manufacturers and conduct their own quality-control inspections. With more than two billion people flying every year, “commercial air transport is potentially an efficient means for spreading communicable disease widely by surface contact and proximity to infected people,” the World Health Organization cautions in itsGuide to Hygiene and Sanitation in Aviation. Much of the risk comes from being in close contact with an infected person. But contaminated surfaces on airplanes also can spread disease. Some airlines are reluctant to discuss how much cleansing airliners get. Typically, planes get a once-over straightening-up between flights and usually a more thorough cleaning overnight or between long international flights. Periodically planes get scrubbed from nose to tail when they undergo major maintenance work. 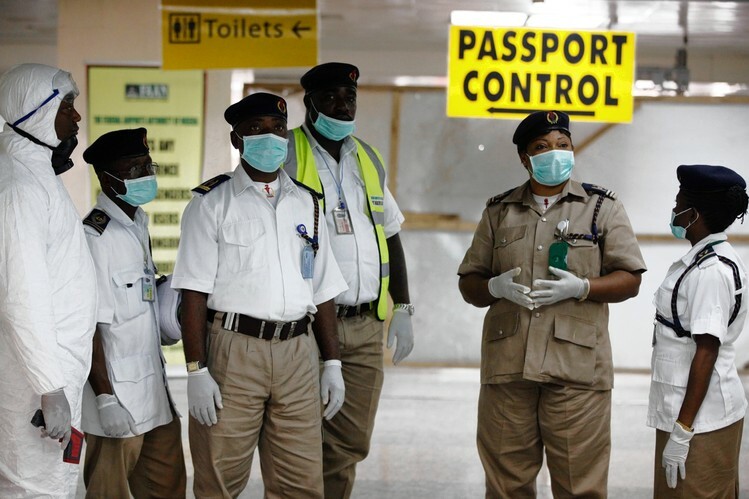 Delta Air Lines and United Airlines say their aircraft that fly into and out of hot spot zones such as western Africa, where several countries are under the threat of the Ebola virus, get a thorough cleaning with disinfecting solution per guidelines issued by the WHO. 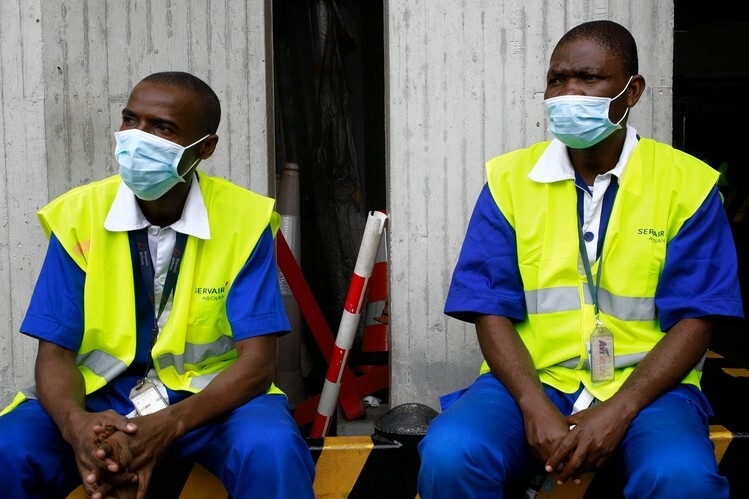 Because of the Ebola threat, United increased its cleaning regimen on aircraft flying between Houston and Lagos, Nigeria, on the WHO’s recommendation. The Centers for Disease Control and Prevention also issued guidelines for protecting crew members and reporting ill passengers. Airlines say they are complying. Medical studies have shown that air travelers face higher rates of infection: One study pegged the increased risk of catching a cold at 20%. Much of the danger comes from the people within two rows around you. But viruses and bacteria can live for hours on some surfaces. Some viral particles have been found to be active up to a day in certain places. Tray tables can be contaminated. Seat-back pockets, which get stuffed with used tissues, soiled napkins, dirty diapers and trash, can be particularly scuzzy. It’s also difficult to know which germs are lurking in an airline’s pillows and blankets, which sometimes don’t get sent to the laundry until the end of a day’s flights. Carriers don’t report what they spend for cleaning, but some have said they reduced costs in that area when pinched economically. They have also mentioned boosting spending on cleaning during economic recovery after customer complaints about dirty airplanes. Two years after emerging from bankruptcy reorganization, United said it would do “deep cleanings” on planes several times a year, instead of once every 18 months, after increased customer cleanliness complaints. Singapore Airlines spokesman James Bradbury-Boyd says a crew of up to 12 contract workers spends about 40 minutes cleaning a Boeing 777-300 during a typical stopover in Houston. Floors get vacuumed, sheets are changed in crew rest areas, and toilets, waste bins, galley floors and wine chillers are washed. Pillows, headrest covers and blankets get changed out. But while airlines know a visible mess alienates passengers, the more serious cleaning is the cleaning you can’t see. Most airlines say there’s not enough time between domestic flights to clean out seat-back pockets or wipe down tray tables—that happens in overnight cleanings. And there are small variations in how airlines clean. United, Delta and American Airlines say bathrooms and galleys get cleaned with disinfectant during overnight cleanings and after long international flights. But that’s not always the case for passenger tray tables. United uses general-purpose cleaners on them; Delta uses disinfectant. American says its normal procedure is to clean, then disinfect, but that may soon change. In 2010, Delta spent a year testing disinfectant products for cleaning and for availability world-wide before settling on one standard following its merger with Northwest Airlines. (A Delta spokesman wouldn’t reveal which product it uses.) Use of disinfectants can be tricky, since some can corrode metals and cause damage to materials in aircraft interiors. Mike Mayer, United’s senior manager of aircraft appearance, says the airline believes all-purpose cleaners like Formula 409 and Fantastik clean better than disinfectants in seating areas. For domestic flights, the “turn time” between flights often dictates what kind of cleaning the airplane gets, Mr. Mayer says. On quick turns, workers remove visible trash from seat-back pockets. On standard turns, cleaning crews actually go through and clean the seat-back pockets out. And if there are bigger problems, flights will get delayed. “If someone vomited on a seat, we are going to take the delay and clean it up,” Mr. Mayer says. With all flights, the bathrooms and galleys get cleaned and supplies get restocked. Workers are asked to remove trash, wipe crumbs off seats, put all armrests down and clean up large spills. Airplanes aren’t vacuumed until overnight cleaning. A quick early-morning trip full of business travelers may arrive virtually spotless. Long international flights? Way worse. “After eight or 10 hours in the air, the amount of trash is really amazing,” Mr. Mayer said. Most customer feedback on long-haul flights involves messy lavatories, Mr. Mayer said. On domestic trips, seat-back pocket trash is “probably one of the top pet peeves,” he said. On a tight turn, cleaners just don’t have time to clean it all out. Every 35 to 55 days, depending on the aircraft type, United planes get a “deep cleaning” that includes washing the ceilings and sidewalls and the seat-bottom cushions. American says it does its version of deep cleaning—washing seat cushions and cleaning carpets and floors, lavatories, bins, tray tables—every 30 days. Delta said its planes get a deep cleaning every 90 to 100 days when jets get regular maintenance work. Greg / September 12, 2014 / Comments are off for this post. When it comes to cleaning, the tools you use are just as important as the effort you put in. If the cleaning task at hand happens to be cleaning off a counter top, mopping a floor, or other similar tasks; the best choice for doing so would be a microfiber cloth. Microfiber cloths are far superior to the average rag when it comes to absorbency and soil removal. So, why are microfiber cloths so much more effective? Well, the good people at Town and Country Cleaning, may have the answer to that question. This article, gives four reasons why microfiber is the superior cleaning tool. What Makes Microfibers Superior For Cleaning? They are made up of tiny split fibers that act like paddlewheels scooping up and retaining dirt and soils until they are laundered out. Microfiber materials can hold many times (roughly 7 to 8 times) their own weight in liquid and clean far more effectively than cotton (90+ % soil removal versus 30% for cotton). Microfibers are available in colors to help prevent cross-contamination. At Town and Country Cleaning Services, we use red/orange in bathrooms only, other colors for other parts of the house. We build in color-coding to prevent cross-contamination as we clean. Your kitchen person may not be able to tell where a cloth came from – but if it is red/orange, they know it does NOT belong in their tray. They pick up and hold dirt better and longer. They launder readily and come back for more. Town and Country Cleaning Service’s “hospital-grade” microfibers used in our residential cleans can be laundered hundreds of times – ideally with temperatures up to 160o F and dried up to that temperature as well. They have been shown in a University of California – Davis study to remove debris, bacteria and viruses to at least the 99% level with pure water. It is exciting to pursue the theory that disinfection may prove attainable with NO toxins! Greg / September 5, 2014 / Comments are off for this post. While many people are aware that traditional cleaners may contain some ingredients that may be toxic or harmful, they may not know exactly what those ingredients are or how they can negatively effect humans or pets. This article from Green Cleaning Magazine, discusses one very common and potentially harmful ingredient found in many everyday products; pthalates. The article not only informs you on where phalates may be found, it also discusses the harm they may cause; while also giving tips on how you can avoid them. This is the fifth installment of our ongoing series aimed to help you better understand the ingredients—both desirable and undesirable—in your home cleaning and personal care products. We arm you with information and provide a solid assessment of each ingredient so you can make educated decisions for yourself and your family. What It Is: A family of synthetic chemicals primarily used to soften plastic, but also used to lubricate other substances, help lotions penetrate and soften the skin, and extend the life of fragrance. Where It’s Found: Phthalates are a widespread contaminant in America’s buildings and waterways. As a plasticizer, they can be found in food packaging, beverage bottles, soft toys, vinyl floor tile, vinyl seating in cars, diaper changing and yoga mats, polymer clays, furniture, water pipes, building materials, and electronics. Most products containing PVC (polyvinyl chloride or vinyl, recycling code #3) contain phthalates. In household products they’re found in detergents, soaps, laundry supplies, and home decorating materials. Cosmetics and personal care products contain a host of phthalates. You’ll find them in deodorants, shampoos, nail polish (where they prevent chipping), hair spray (where they prevent stiffness), perfumes, lotions, creams, and powders. Phthalates are found in medical and dental devices, such as catheters, IV bags and tubes, and orthodontia supplies. What’s the Problem? : Phthalates belong to a set of toxic chemicals called endocrine disruptors, meaning they attack the hormone system. They’ve been linked to breast cancer, abnormal development of the male reproductive system, insulin resistance, thyroid problems, infertility, reduced testosterone, asthma and allergies. How Are You Exposed? : Because phthalates are not chemically bound to the products they’re added to, they’re continuously released into the air or food or liquid. Humans are exposed by ingestion, absorption, and inhalation. Children are especially vulnerable. Phthalates cross the placenta, so they can be passed from mother to infant in utero. In 2002, the CDC (Center for Disease Control and Prevention) tested 72 name-brand cosmetics, and found phthalates in three-quarters of them. Testing humans in 2008, CDC found the highest levels in women of childbearing age, presumably because of their use of cosmetics. Look for products marketed as phthalate-free. Check ingredient labels. It may be listed as DBP (dibutyl phthalate), DNOP (di-n-octyl phthalate), DINP (disononyl phthalate), DEP (diethyl phthalate), BBzP (benzyl butyl phthalate), DEHP (di 2-ethylhexl phthalate), DIDP (diisodecyl phthalate), DnHP (di-n-hexyl phthalate), DMP (dimethyl phthalate), and DnOP (di-n-octylphthalate). Avoid cooking or microwaving in plastic. Don’t give soft plastic toys to children or pets. Choose personal care products, detergents, and cleansers that don’t have the word “fragrance” on the ingredients list. Even if the label says “fragrance free” the product may still contain phthalates. Paints and other hobby products may contain phthalates as a solvent, so provide plenty of ventilation when using them. Vinyl shows up in a variety of products—lawn furniture, garden hoses, even raincoats. Switch to a non-vinyl shower curtain. Avoid most commercial air fresheners. Check out the database of safe household and personal care products at EWG.org, site of the Environmental Working Group. Greg / September 3, 2014 / Comments are off for this post. It is no secret that vinegar is often used in many DIY cleaning jobs. Whether it used completely on its own, or coupled with something like baking soda, vinegar is a common ingredient for all kinds of tasks. The question now becomes, does it really work? What exactly is in vinegar that makes it such an effective cleaning agent? This article from Town and Country Cleaning, discusses some of the myths and facts about vinegar. Can vinegar really disinfect? Can it be used on any surface? Is it really as effective as many people claim it to be? These questions and several others are answered in the article below. Does vinegar clean? Newspaper articles, magazines, green cleaning websites all tout vinegar as a miracle cleaner and ‘disinfectant’. All you need they say, is to put a little household vinegar in water and voila – you have a great cleaning and disinfecting solution. Let’s look at how well (or not) the claims stand up. Vinegar is an acidic solution with a pH of organic acids, mainly acetic, and other organic compounds, many of them volatile organic compounds (VOC’s). It is a relatively strong acid with a pH of about 2.0 to 3.0 and is corrosive to many surfaces. The VOC’s of vinegar have not, to the best of my knowledge, been tested for health effects, but the Material Safety Data Sheet (MSDS, soon to be known as Safety Data Sheet) does recommend the use of a respirator when vinegar is used in large quantities or sprayed, as it is during cleaning. Myth or Fact: Vinegar Gets Things ‘Squeaky Clean’. True, sometimes. In the days when all we had to clean with was true soap, the soap left an alkaline residue which had to be rinsed off. If you added an acid to the rinse water it would do a better job of rinsing, so someone added vinegar to the rinse water. It rinsed the surface ‘squeaky clean’. Today (sixty-some years after the introduction of detergents) it is much less common but when and if you have an alkaline residue, adding vinegar to rinse water will still improve the rinse. Vinegar can also be effective in breaking up alkaline soils such as soap scum or hard-water film, but it is much less useful for other types of soil. As an acid, vinegar creates an environment that is inhospitable to many (though certainly not all) undesireable pathogens. Non-diluted vinegar has been shown to achieve kill rates as high as 90% in lab studies. However, in order to be rated as a disinfectant, it would need to achieve a kill rate of at least 99%. Anything that would tend to neutralize its acidity, such as adding an alkaline detergent(i.e. most cleaning agents), would definitely decrease its anti-microbial qualities. In a word, ‘NO’! Installers at one time would recommend (and sometimes still do) using vinegar and water for polyurethane-finished wood floors–mainly because they did NOT want oil soaps to be used. Oil soaps had been the primary wood floor cleaner before polyurethane finishes, but they caused major problems when it came time to re-coat those same finishes. Vinegar and water seemed a safe alternative. It turned out that over time, the acid degraded the finish. At the big flooring show, Surfaces, all manufacturers of wood flooring said ‘Do NOT use vinegar.” Several said it would void their warranty. Note: also heard at this year’s show, manufacturers of vinyl flooring are starting to say the very same thing! Don’t be fooled! See the above note about wood and vinyl. It can also, as is true of any acid, damage many stone surfaces, especially marble, travertine and limestone. Even a brief second’s contact can etch these calcium-based stones. In conclusion, vinegar can be useful as a rinse agent and even as a ‘cleaner’ in certain instances, but its uses for general cleaning and disinfection are highly overrated and misunderstood.